A delicate, velvety, almost sweet palate of cherries and rhubarb that was as soft as dandelion fluff in my mouth. The more it sat, the more intense it became, until I was picking up hints of caramel (from the French oak, I assume) and rich strawberry. There wasn’t a lot of complexity on the finish, but who needs it when there’s this kind of fruit? Just by pure blind luck, I was eating the absolutely perfect dinner with my Fotinos Pinot Noir. I had a Roasted Beet Salad with Toasted Hazelnuts, Goat Cheese and Warm Bacon Dressing, and I gotta say that the tart-sweet beets were a knock-out pairing with the Pinot. Ask me for the recipe, and you can make it when you drink your Fotinos Pinot. But remember: you have to be patient! This wine is like a really pretty, but really shy, young lady. It’s very feminine in every way, and it doesn’t put out easily. Follow my advice, and I think you’ll score. 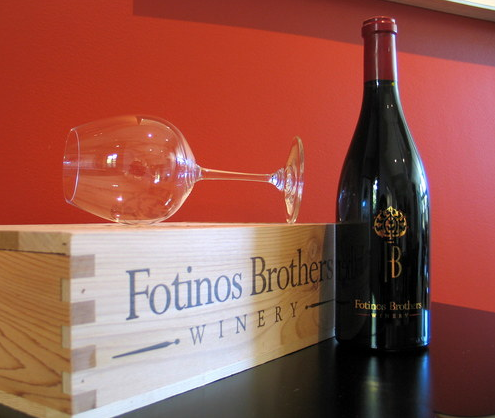 I think the Fotinos 07 pinot is a great example of the variety, and an exceptional growing year as well. If you liked that one, you might consider trying our Carneros Pinot; it’s a little cheaper and just as good (or better)!